This morning I gazed out over my morning coffee into the magick that is my backyard. So much magick to be found in nature if only one pauses, takes a moment, to reflect and connect. I noticed in particular one red leaf on my Gala Apple Tree. I have great love for this apple tree. I have a connection through it to my Grandmother who crossed on Dec. 10, 2011, and also to my parents. My parents also have a great love for and planted Apple Trees at their Missouri Century Farm. A Century Farm designation is one that has been in the family over 100 years – ours has been in our family since 1902. My Grandmother gifted my parents with a special apple tree before she died, which was planted at the farm. My parents in turn gifted me with my Gala apple tree for my birthday in the autumn of 2011. 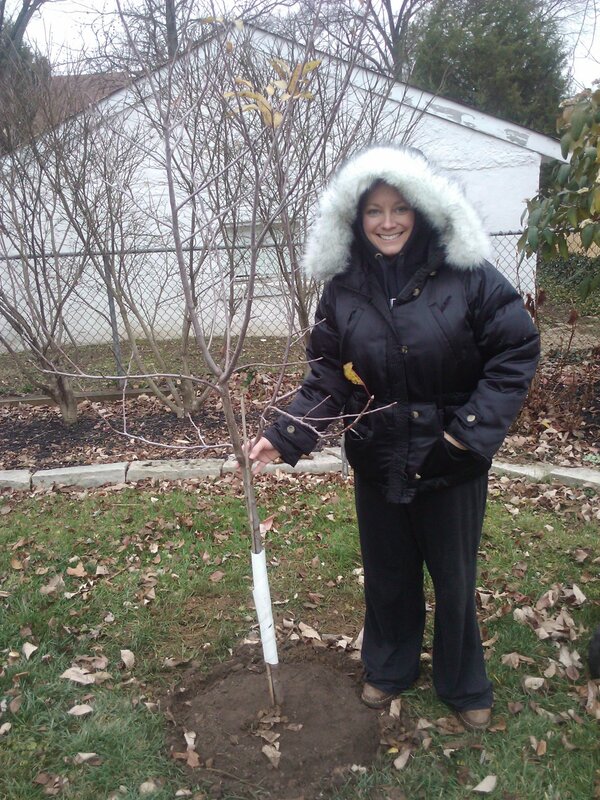 My friend Louise and I planted my Gala apple tree on Dec. 6, 2011 in the snow. Into the hole I placed dirt I collected from the top of Glastonbury Tor and dirt from Dion Fortune’s Grave from my August 2011 Pilgrimage to Glastonbury. Added in of course with a little bit of love from Morona, Morgan of the Earth! The Morrighan is my Matron. Five years ago tomorrow, on Dec. 4, 2011, I wrote an essay to honor part of my Journey with the Apple Tree. 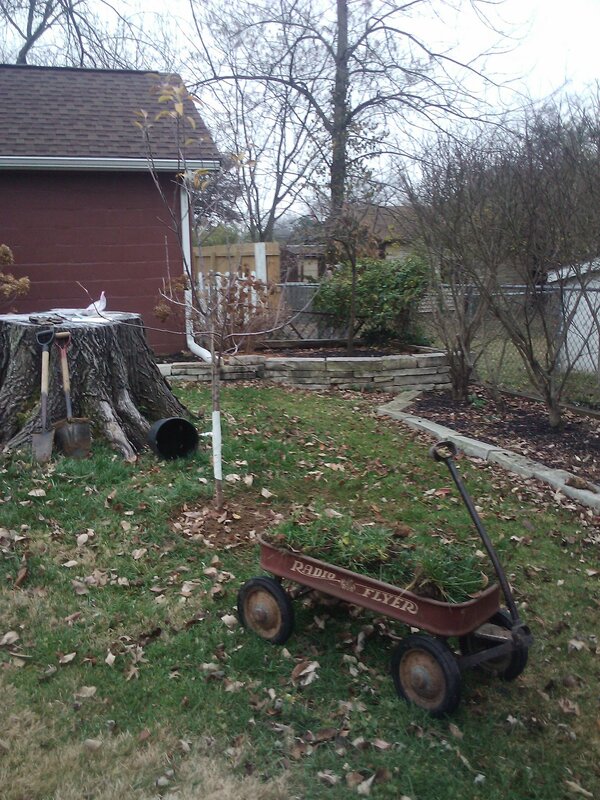 This was also two days prior to planting my own apple tree. And it was also six days before I helped my grandmother to cross over upon her death, This essay was published in the anthology The Green Lovers: A Compilation of Plant Spirit Magick. I donated use of the essay in the book as a fundraiser to benefit a 501c3. I retained all rights to the essay and am now called to share it here with you. This version contains additional information from the previously published version. 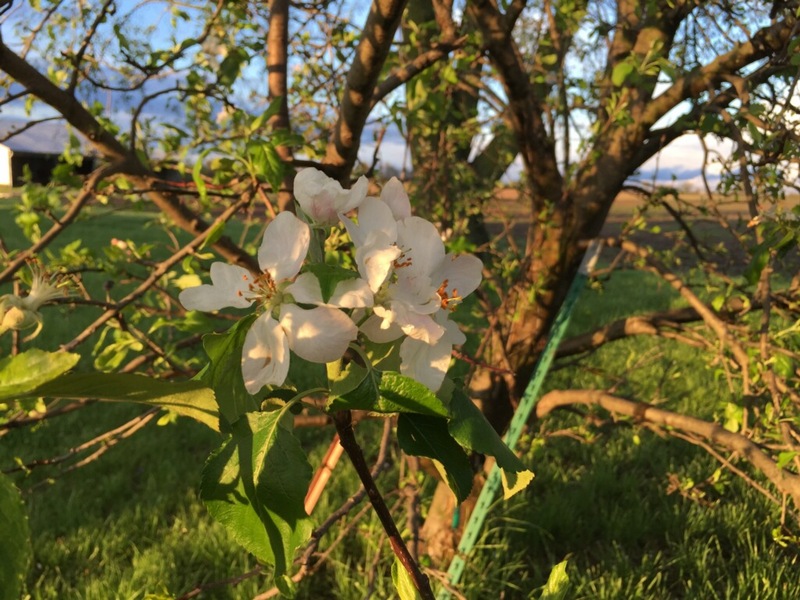 My journey with the Apple Tree has been a winding path that includes visits from Mushroom, Opossum and the Fey, with other guests sprinkled in along the way, adding more spice to Apple’s message, filling in the web with their connections. It definitely takes a village of guides showing the way on a journey through a year of shamanic witchcraft, and they accompanied me, walked with me and offered their wisdom. Apple is a gateway to wisdom, and I am just beginning to understand its gifts. For years we have had several apple trees at our family Century Farm, which has been in our family, on my Mom’s side, over 100 years. The apple trees were planted by my parents, and Mom harvests the apples every year, making pies, baking and sometimes canning apples. Baked apples have always been a fixture of our fall and winter meals, with a little bit of cinnamon of course. I loved the smell of baking apples as a child, and still do. As a witch, the Apple Tree and its fruit play a major role in our lore. The center of much of the stories, of course, is the five pointed star that you will find in the center of an apple, if you cut it horizontally. It contains the pentagram, which is used for magick of many kinds and includes the four elements, spirit and ultimately contains the mystery. Apples come in different colors and their species have been widely varied and new strands propagated, but when we think of the apple, we think of the juicy, red apple of our childhood and mythos. The apple can also be seen as the maiden, mother and crone. The Maiden is represented by the juicy, untouched and unblemished white flesh, the Mother by the protective red covering, and the Crone by the small, black, bitter seeds, containing some poison, yet also containing the essence for regeneration in the spring. When you think of love, or perhaps a correspondence for a love spell, you do not necessarily think of apple as a first choice. Rose is usually the first pick. But what of the apple? Apple is a child of Venus and has many powers, including love. Think of the scent of apple on the spring breeze when new love is beginning to take form. Such magickal properties often show up in regular life. I am reminded of the old wives tale – turn the stem on the apple while reciting the alphabet, and you will find the initial of your love in the letter on which the stem releases from the apple. I learned this as a child, yet I must admit that to this day, every time I have an apple, you can catch me turning its stem. Apple is not just for love of course. It has properties of healing, happiness, wisdom and the mysteries. With apples abounding and hearing apple in our lore for years, it still took a trip across the ocean on a Glastonbury Pilgrimage in August 2011 for me to make my first real connection with the Apple Tree. Glastonbury is a place of magick, and many believe, as do I, that it is the Avalon of our myths – Avalon, the Isle of Apple Trees. We are drawn to the image of the Summerland as well, with meadows and sweet apple blossoms scenting the air. What better place to begin a relationship with the Apple Tree. One day, after we arrived back at the Chalice Well House where we were staying in Glastonbury, I went for a walk in the gardens. It was so incredibly beautiful, and I walked without thought and let the spirits move me. First I came upon an apple that had fallen in the path, and I saved it to put on our altar. As I continued to walk, I was drawn off the path. I stumbled upon a circle of Mushrooms near an apple tree. Understanding the strong relationship of the Fey to both Mushrooms and Apples, it makes sense that in such a magickal place, where the land spirits are so active, that the three would be found together – Apple, Mushroom and Faery. That night, we had a teaching on the Nine Morgans. Afterwards, we went out to the Chalice Well Gardens under the night sky to do a journey. We walked through the lavender that lined the path, with it brushing our robes and scenting the night air. We walked to the Apple Tree and all gathered underneath its low-hanging branches. I realized that this was the apple tree earlier in the day that had gifted me an apple for our altar. Our journey’s intention was to visit the Isle of Avalon and meet one of the Morgans. We started by reading this hauntingly beautiful poem that one of us had written. I was sitting cross-legged under the apple tree as he read, and there was an incredible, crazy heartbeat rushing through my body – its energy spiraling up and down my body. It was from the Apple Tree. Then we had a guided journey. I felt so close to the Apple Tree. I moved into the Apple Tree, and it became my journey vehicle as I rode its trunk down below and through the dirt, and dropped through the earth. It was my gateway to Avalon, to the Undeworld and to the land of Faery. There was a river coming from the blackness of a cave, and it was feeding the lake around the island. I walked over towards an apple tree, and one of the Morgans walked over to greet me. It was Morona, the Morgan of the Earth. She was fair skinned, had black hair and was wearing a black dress. She had me sit on a bench with her by the Apple Tree. My Matron, the Morrighan, also paid a visit under that apple tree. Apple has been known as the Tree of Knowledge, and in some religions used as a tool of fear. For some, it is the Tree of Life or their World Tree. Indeed, one can get caught up in a quest for knowledge, for knowledge’s sake, but knowledge, without experience, is just knowledge. The Morgan and her Apple Trees are something much more than this. On the path of the Witch, we seek the wisdom of the three worlds on our journey to heal ourselves, others and ultimately the three worlds. Wisdom is not something you can order up on a menu, nor can you exactly go in search of it – it is what happens on your journey when you experience the mysteries. What better gate to the mysteries than the Apple Tree. The seeds of an apple can turn into a tree not quite like the parent tree you originally planted. Its seeds of knowledge are tempered through its own experience in becoming a new, unique tree – gaining wisdom through the process, leafing out with its own striking beauty. Wisdom is gained by experiencing the mysteries and applying your knowledge to that personal experience. No one can do it for you, which is why they call it the Work. I like to think of the Great Work as using that wisdom to heal the three worlds. Apple is a gateway to the three worlds. It holds the Mysteries. It can take us to the Underworld and the Land of Faery. The Fey hold the wisdom of the land and are able to connect with us, sharing their wisdom, through the Apple Tree. In Avalon, the Lady in White, came to share her stories with us. Is she the Spirit of the Apple Tree? Faery? Or a combination of both? Of course, in the Arthurian lore, we are reminded of Morgana. who some say is Fey, and also of the Priestesses of Avalon on the Apple Isle. I think the Lady in White, for me, is all of these things and more. She holds a key to the gate of the Mysteries, if you choose to unlock it. As for the apple I found and placed on our altar, the next night, a teacher placed the apple into the chalice before a teaching on the Serpents – Red and White. It is interesting that there was a connection of the apple from one night to the next, as I went from a journey with the Morgans and the Isle of Avalon, to an initiatory journey with Queen Aroxanna. The Apple Tree and its fruit are definitely a gateway – a gateway to wisdom, a gateway between the worlds and a conduit to connecting with the Fey. 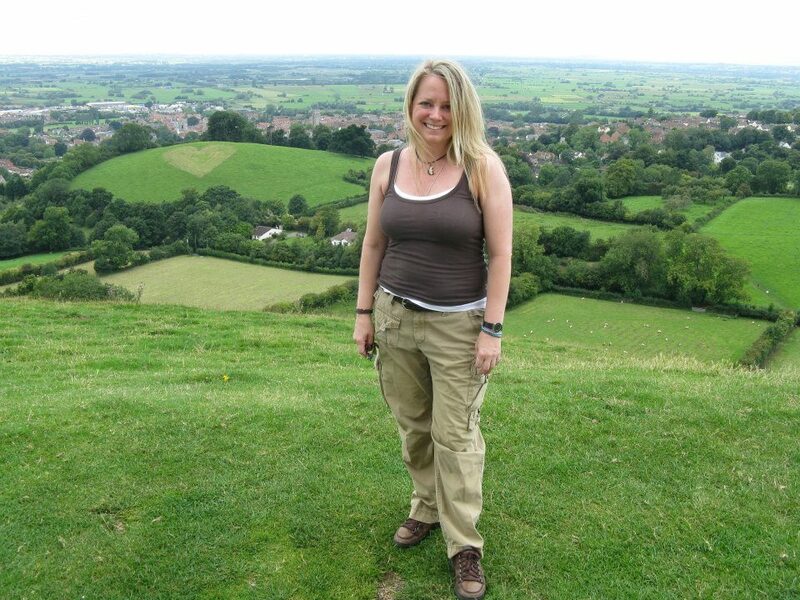 Walking the same grounds that were walked, and owned, by Dion Fortune during my Aug. 2011 Pilgrimage to Glastonbury. Blessed be! In that journey, there was a red stream and a white stream and their waterfalls formed a pool. As I think back on this, though the red and white symbolized the serpents, the red and the white also were the apple – the red skin of the apple and the juicy white center, the blood of sacrifice and the white of purification and cleansing. I was not surprised at the connection with the Fey to either the Apple Tree or to my own journey. Tree spirits are not shy about making themselves known when they have something to teach. 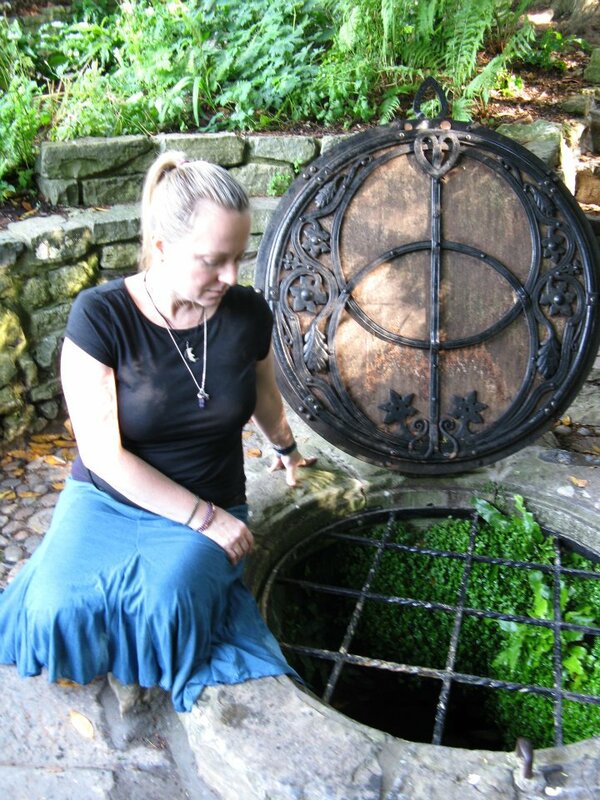 When I returned from Glastonbury, going back to my mundane life, yet jumping wholeheartedly into my shadowwork for the end of our year of shamanic witchcraft, the Apple Tree made it clear that it was not yet done with me. But first, the Spirit of the Apple Tree had to find a way to make me listen. In early October, I went to visit our family farm. The apples were just ripening, and not quite ripe enough to pick. My parents and I were enjoying the night air on the screened in back porch. Next thing we saw was an opossum saunter across the backyard. He headed straight for one of the apple trees, which I soon was to realize was his first choice among apple trees. He climbed up into the tree and climbed back down with an apple in his mouth. Boy wasn’t that just the happiest little opossum you have ever seen! He sat right down by the trunk and used his two front paws to eat his little prize. After he was finished, he went back up in the tree for more. The only thing that scared him away for a little while was our resident Owl. This scene repeated itself the next night. My parents were a little bit frustrated that the opossum might eat all their apples, but I pointed out the absolute joy and pleasure of that little creature dining on nature’s finest gift. I really had not paid much attention to the apples trees at our farm before. The opossum, so intent on eating from the fruit of the apple tree, drew my focus back to the apple tree and made me realize the need to be silent and to listen. It drew me back from my busy life. By this little creature’s interaction with the Apple Tree, I saw wisdom. The opossum had the knowledge to climb the tree, the daring and the will to do it, and in watching him, I saw the wisdom in silent moments. To me, being silent is where the mystery is, and opossums are silent. He was my guide to the apple tree, causing me to pay more attention to the apple’s messages and mysteries. I do believe in offerings to the spirits of trees, plants, animals and the land, and I do it regularly. However, I had left for home before a friend made a great suggestion, which was that I should leave an apple at the base of the apple tree. My parents were still at the farm for one more night, and my Dad, used to my seemingly strange requests, granted this one and placed an apple at the base of the tree. The next day, the apple was gone. 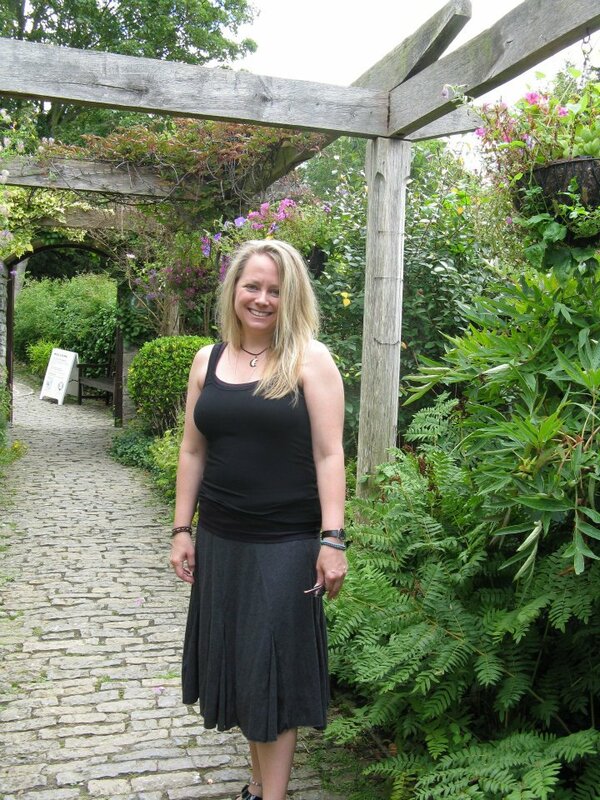 Then the next weekend I went back to the farm by myself for my own little shamanic retreat. It also was a rite of passage of sorts for me as well, as I had never had stayed there by myself. My second night that weekend, I made my weekly offering to the Morrighan, the Fey and Spirits of the Place. This time I poured wine at every tree in our yard in a circle around the farmhouse. I also left an apple out in offering again for the opossum and the apple tree. I woke up in the middle of the night, went to the kitchen and looked out the back window as I like to do, with the big old elms and the apple trees in back. The apple was gone. I let my gaze wander, and there was the opossum – he had just walked away from eating his apple. As he walked around the house, I had to go back to bed, but something made me look out my bedroom window. And there, under the moonlight, was the opossum right outside my window, and he climbed up the tree next to my window – definitely a first time for everything. The energy was crackling in this connection I felt tugging at my heart, a thing of beauty and to be honored. I thanked the Apple and the Opossum and said good night. For me, the farm is all about stillness – the mystery that is seen and found in the quiet stillness of nature. The opossum is the stillness and the mystery is seen in the apple, which we can see in any challenge or journey if we only slow down long enough to look, peel back the mystery and savor its juices. I must add that the opossum had a banner fall harvest – by the time my parents got back up to the farm to pick the apples, the opossum had cleaned out every last one. Of course, the nature of the gifts of life lessons on this journey is not always easy. We need something to push against or to overcome sometimes to provide strong fuel for the fire as we blaze our soul’s trail. You could look at it as biting through the apple’s more bitter skin to get to the sweet pleasures and meanings inside. Or, you could look at it inverted, as the world of Faery can be viewed as inverted to ours, like the bitter poison of the seeds, working out to the sweetness of the white flesh and the protection of the apple’s skin. For a few months over the waning part of this year, I had felt the pull of the Morrighan, Hecate, Cerridwen and Baba Yaga to write a ritual. We scheduled a Dark Moon ritual with our coven, but I actually did not write the ritual until the day of the gathering when the Dark Ladies and my guides started to speak to me. Those guides included the voice of the Apple Tree. It seems highly appropriate in considering all of this now, given the connections of the Dark Goddesses to the Apple and the Underworld. Here is the alignment with the Dark Goddess and Moon that came to me that day. She holds out the Key in her rot covered hand – will we take it, she asks? Key to unlock the secrets of the below, of the depths and of our soul. Who will be brave enough to take her gifts when offered? She asks a path of service in return. Will you accept her hand now, and the key that has been offered? The ritual was moving and poignant. Just as the Apple Tree had gifted me with its message, and guided me in writing this ritual, the Dark Goddesses lent their support as well. The next morning, though it was daylight, a young opossum made a visit to my home in the suburbs. It was not long after this that my parents purchased an apple tree for my backyard, and it will be planted in the same area. I had asked the Spirit of the Apple Tree to let me know one night where to plant this tree, so that I would know when I woke up in the morning. It came to me in a dream visit to tell me where to plant the tree in my yard. The Apple Tree was a fitting conclusion to this first year with the Morrighan as my matron. It is clear that apple drew me to its mysteries, and draws other witches, for a reason, but what is it about apples that draw everyone to them? Apples are home. They are comfort and safety. Candles are even made with the scent of apple. We know apple is healing and has vitamins, but why do kids like it so much? It is again about that comfort, love and happiness, such as found in the simple pleasures of life. It is safety with the pentagram, even for those unfamiliar with its mysteries. Apples are the four seasons. 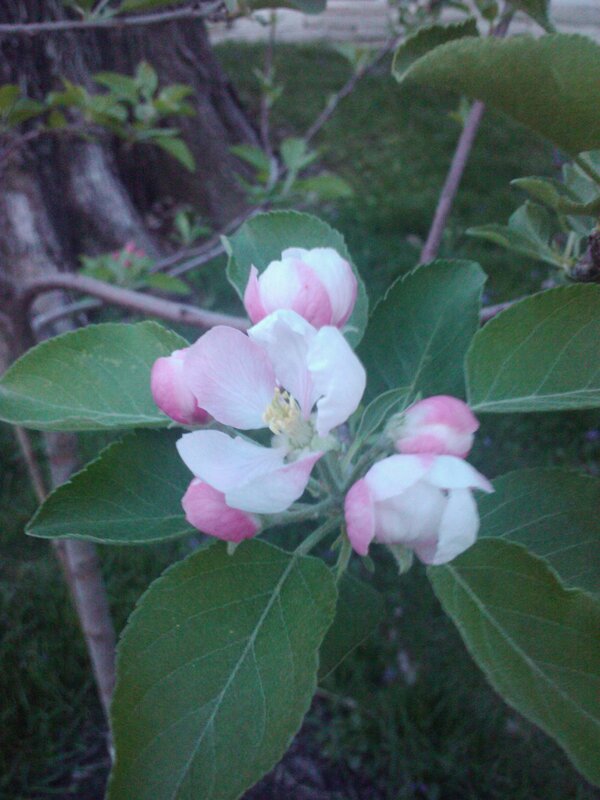 It is spring blossoms and the Faery and summer with green apples on the tree. Fall is ripening apples, reminiscent of hayrides, wassail and family trips to the apple orchard. What is it about the apple orchard that makes it so fun? The idea of fertility and an abundant harvest as you fill up the apple baskets. Apples signify abundance and fertility, and through that, success and good luck. They are accessible and friendly trees, with low hanging fruit that children can relate to as well. We eat apples in all sorts of forms and in the end we can what is left or put the rest on the compost. Any apples remaining then rot back into the earth as fertilizer for next year’s growth or start their own apple trees. We can work with apple through our journey of the year, just as we see its growth, decline and renewal in the physical world. Meditate with the apple tree, become one with the tree, see and feel what it experiences. Or call on the Spirit of the Apple Tree in journey to ask what lessons it has to teach you. The possibilities are as endless as the apples in the orchard, if you chose to pick one and taste of its fruit. The next time you walk by a display of apples, give thanks to the Apple Tree for its gift of Wisdom.